My Bike Rack on My Car Covers My License Plate. Can I Get a Ticket for This? At the Horrible Hundred last weekend, a cyclist asked whether he could be ticketed for a bike rack obstructing the view of a license plate. It was something I had never thought about despite owning a bike, probably because my rack sits on top of my car. I did some research to find out the law in Florida. As it so often goes with the law, there is no simple answer to the question. There is a split of authorities in Florida. This means the law is different in different parts of the state because courts have made conflicting decisions on the same topic and the Supreme Court of Florida has not clarified the rule. And all letters, numerals, printing, writing, and other identification marks upon the plates regarding the word “Florida,” the registration decal, and the alphanumeric designation shall be clear and distinct and free from defacement, mutilation, grease, and other obscuring matter, so that they will be plainly visible and legible at all times 100 feet from the rear or front. Where I live, in the Second District Court of Appeals (DCA) it is not a violation for a properly attached bike rack or trailer hitch to block the view of the license plate. Trailer hitches, handicap chairs and u-hauls are also exempt from the rule. There is only a violation if the obscuring matter is physically on the license plate, for example grease or mud smeared over the letters on the plate. 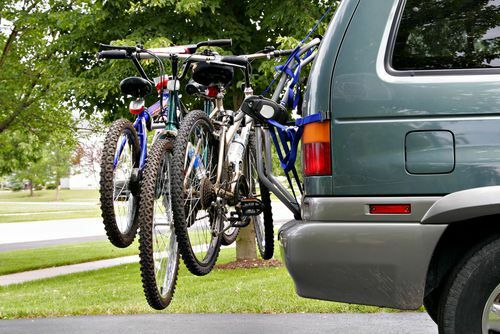 In contrast, the First and Third and Fifth DCAs have decided that a bicycle rack, luggage rack or other external object blocking a license plate is grounds for a citation. Even a broken plate light hanging down slightly over the license plate can subject you to a ticket. The Fourth DCA has not published any decisions about the issue. With the current trend in Florida leaning towards any obstruction being a violation of the rule, perhaps Floridians should consider a roof mount for their bicycles or get an additional plate to put in their rear windows to avoid a ticket.